The images in this series are all very personal to me, both in inspiration and content. "The Flood" marks my resumption of this series after three years working on other projects. 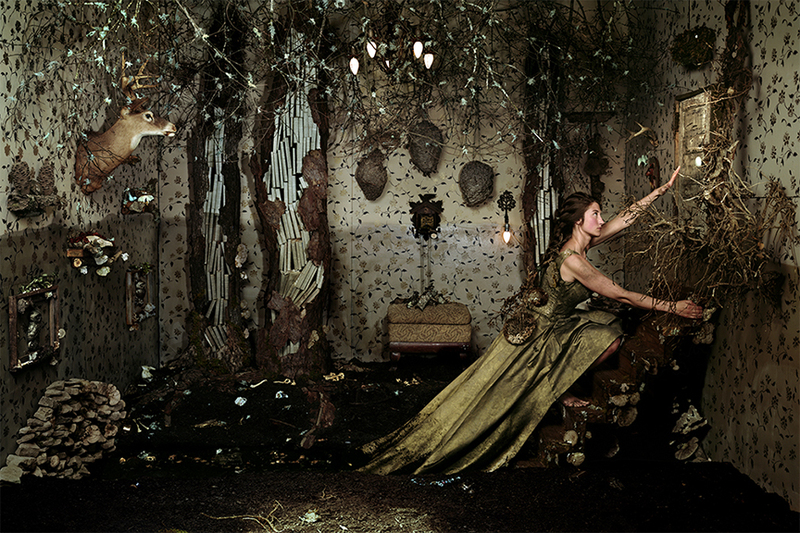 The previous Scenes image, "Shelter," was made during a two and a half month artist residency at Cheekwood Botanical Garden and Museum of Art in Nashville. That experience was much like a fairy tale; an amazing budget, a crew of dedicated people to help me, and the time and freedom to dedicate solely to the work. The residency was profound and wonderful but also intense and somewhat overwhelming for someone who is an introvert by nature. Looking back on everything now, I think coming home from something so unique was difficult. Unconsciously, I gave myself some time away from the series and away from photography in general, instead working on a few public art projects and smaller commissioned pieces and devoting more time to my other passion, animal welfare. When Crusade For Art awarded me a grant to make an image for their CSA program, my heart leapt and I was very happy to discover that I was finally ready to get back to the series which is truly closest to my heart. I think "The Flood" represents finding my way back.